I’m excited, but to be honest – a little nervous at the same time to meet you, or should I say write to you here. For those of you who don’t know me (yet! ), I arrived from France almost two and a half years ago to finish my studies at Seneca College. I had no intention of staying here in Toronto, but as we say in France, c’est la vie – life happens. When I was asked to contribute a piece to our blog, I was thrilled, yet as I sat down to write – I actually didn’t know where to start. After re-reading the first few inspirational posts from Andrea, Jess, Susan and Juli – my writer’s block began to fade. Andrea spoke to the adventure of starting her own business; Jess spoke about what it is like to be a newcomer to the field of PR; Susan’s piece focused on ageism and women working in our industry and Juli spoke to getting her first shot in this business. Their contribution gave me cause to reflect on my own journey, and the amazing women who took a chance on me when I had absolutely no experience in this business. Up until now, I have often credited my accomplishments to the great fortune I’ve had, but now I have to ask – was it really just luck that carried me this far? Four years ago, I moved to Paris to study communications, and while I didn’t really know what that entailed at the time, what I did know is that I loved planning events and I loved going to the movies! Was there a dream job out there that would allow me to work on both? At the time – I honestly had no idea. Then I entered the world of internships, a life-altering phase of my education that would change everything for me. After blanketing the city of Paris with over a hundred resumés, I finally found a three-month internship at the Matilde Incerti PR company. One month into the job, I realized I was not living the 35 hour week (with an hour for lunch) routine I had once envisioned – I honestly didn’t know what hit me. Pitching and scheduling interviews and covering press screenings became my daily reality. Before I knew it, my three-month internship turned into six, and I found myself working at the 2012 Festival De Cannes. When it came to an end and Matilde had to write a progress report for my school, the last question for her to answer was this: Is this student in the right field and should she continue in PR? Her honesty struck me – she wasn’t sure. 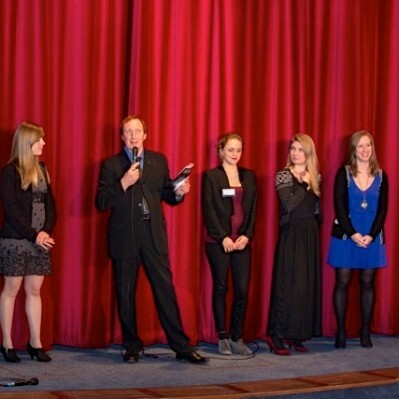 Shortly after, I moved to Edinburgh for a three-month internship at the French Film Festival UK. It was Ilona and Richard, the co-directors of the festival, who really gave me the opportunity to use my voice, and they showed me that my voice actually counts. When I moved back to France for an internship with Claire Viroulaud of Ciné-Sud Promotion, I was pretty sure this industry was where I belonged, and Claire strengthened my resolve. When you meet someone who doesn’t treat you like an intern but rather part of her team, you can’t help but love every single day. Come to think of it, the hardest part of my internship was telling Claire that I got a visa to work in Canada, and I wasn’t sure if or when I would come back. I do consider myself to be very lucky. Without all of the great women in my life, I wouldn’t be where I am now. When I was interviewed in Paris and I couldn’t even name the film journalists from Le Figaro (equivalent of The Toronto Star), Matilde gave me a chance. When I was interviewed at TIFF and I couldn’t even name one Canadian journalist, Geneviève gave me a chance too. If I could only be 10% of each of the amazing women I have worked with, I’d be the luckiest! But let’s rewind. The answer to my question in the second paragraph here is definitely no – being given a chance is not enough, it’s what you make of it that counts. You definitely need people to take a chance on you, but you have to make something out of it. If you have a true reason to be here – create and find your own place in whatever field you are passionate about. Find a reason to fight and everything will slowly make sense. You have to trust in yourself before anyone can trust you. Personally I love fighting for movies and I hope I get the chance to do it for a very long time! Please remember the great women, and men, who gave you your first shot and drop them a line. A thank you note is always worth it, don’t you think? After all – you wouldn’t be here without them. And if you find that no one has given you your first chance yet – choose yourself, and give yourself a chance! P.S. I’ve mentioned a lot of amazing women in this piece, but Jérémie Charrier, Richard Mowe, Thierry Lenouvel, Pierre Grangereau and Mister Daniel French – I haven’t forgotten you! Merci! !